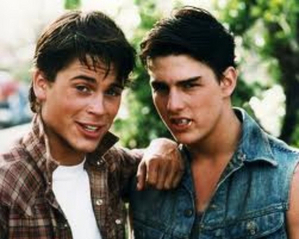 THE OUTSIDERS emerged in 1983 as the long-delayed filming of the S.E.Hinton novel that was force-fed to so many of us in high school. It had lukewarm public reception, and was drubbed by critics, who had decided on director Francis Ford Coppola as their whipping boy of-the-moment, despite his past brilliance. The relevance of a story about lower-class ‘greasers’ and middle-class ‘socs’ (soashes) in the Tulsa, Oklahoma of 1967 may hinge largely on the subjectivity of the viewer. Adolescent punks and snobs making life miserable for each other isn’t all that urgent for those who had to endure both of these jerktypes in teen land: memories conjured up are none too dear. In this story, those divisions are the only ones that exist, aside from brief allusions to the monolithic world of grownups. 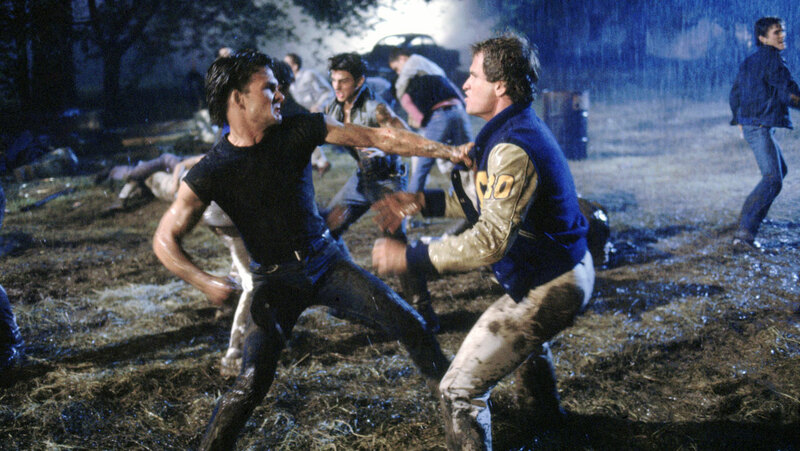 The slight plot turns on the vain attempts of two ‘greasers’ (played by C.Thomas Howell and Ralph Macchio) to escape their trapped existence, or at least make heads or tails of it. Within its confines—you’ll wonder why it wasn’t made years before—the movie works, thanks to Coppola’s supreme eye for visuals. He tries to give the plight of these kids poetic dimensions, and Stephen H. Burum’s cinematography is just beautiful. The rich look keeps you watching even if the story doesn’t. Acting all around is quite good, though the script gets cheesy. Foremost is Howell, as the most sympathetic in the group; his eyes hold drama, hurt, questions, resignation and what makes being a teenager such a tug-of-war between exultation and torture. Flanked by more flamboyant classmates like Matt Dillon and Diane Lane, he still holds your attention. Good enough, as also on hand are Patrick Swayze, Rob Lowe, Leif Garrett, Emilio Estevez and Tom Cruise. Costing $10,000,000, it landed on spot #27 for its year, grossing $25,700,000. With Tom Waits, Gailard Sartain and William Smith (in a rare gentle role). Originally, the film ran 91 minutes, but in 2005 Coppola put back in deleted material, buffing it up to 115 minutes. He also changed some of the score (excessive orchestra from Carmine Coppola) to pop tunes reflecting the mid 60s. If you wish to read the book, it should be easy to find, having sold 13,000,000 copies.